At the University of Rhode Island, the “ONCAMPUS” Rhode Island program is a language support program for first-year international students that gives them opportunities to learn more about American culture. 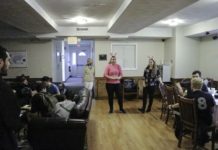 According to Program Director Linda Foley-Vinay, the international students undergo a sort of hybrid program, taking two or three courses with all other URI students and then two to three courses that are limited to them. “The point of [these classes] is to make sure that they’re learning how to be successful students in the United States and how to develop those skills and habits that are necessary for success,” Foley-Vinay said. There are 22 students in the “ONCAMPUS” program from all different locations around the world. Foley-Vinay described how the location and community of URI are big factors that attract international students. Being in-between Boston and New York City, the URI campus is a perfect spot in the middle of everything for students to stay. Like many first-year college students, some face challenges adjusting to college life. “That transition from having a very structured learning experience at the high school level and then coming to an environment where you’re expected to be an autonomous learner and make your own best decisions for yourself is a really hard transition, especially when you’re also making all of these big changes,” Employee Assistance program instructor Michael Robinson said. “ONCAMPUS” is important, not only to the students but for faculty involved as well. “I probably most enjoy getting to know the students and I feel like I learn more from them than they probably learn from me,” Robinson said.